The Port of Antwerp handled 98,229,046 tonnes of freight in the first six months of 2014. That is 2.7% more than in the same period last year, itself already a record year. Container freight once more contributed good growth figures, while liquid bulk too continued the upward trend. 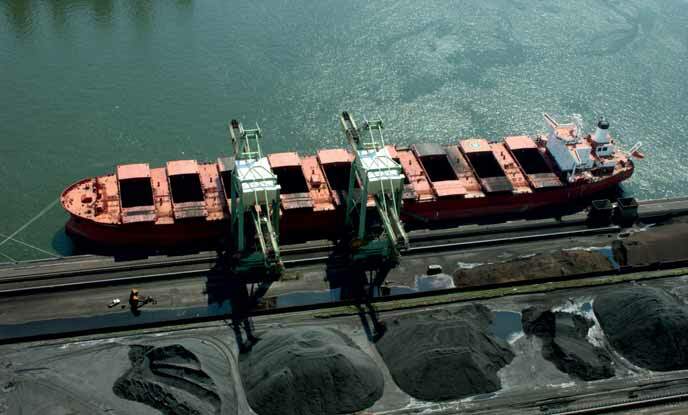 The dry bulk volume came to 6,870,625 tonnes, a decrease of 5.0% compared with the same period last year. Once again, the decline is mainly due to the amount of coal handled. During the past six months the coal volume was down by 30.5% to 839,642 tonnes. Ore (up 9.2% to 1,361,762 tonnes) and sand and gravel (up 23.9% to 646,062 tonnes) for their part turned in significantly better figures than in the first half of 2013. The container freight volume rose by 4.0% during the first six months, to 53,553,954 tonnes. This corresponds to 4,416,132 TEU, an increase of 2.9%. March was an absolute record month for containers. Ro/ro freight for its part continued to perform well during the past six months, with a volume of 2,346,506 tonnes, 1.3% more than the same period last year, although the number of cars handled was down slightly (by 1.4%) to 643,164. Conventional breakbulk on the other hand produced negative figures, down by 6.0% to 5,028,876 tonnes. One important factor in this decline is that a proportion of the fruit imports now arrives in containers instead of conventional freight. To a certain extent the negative figures therefore indicate a shift in the method of transport rather than a fall in the absolute volume. Steel for its part experienced a stronger second quarter and finished the first half year with modest growth of 0.2%, to 3,293,418 tonnes. The liquid bulk volume rose during the first half of the year by 4.0% to 30,429,085 tonnes. Petroleum derivatives experienced strong growth of 7.8%, reaching 22,380,646 tonnes. Chemicals and crude oil on the other hand suffered a decline, down respectively by 4.2% to 5,484,968 tonnes and 7.4% to 2,363,517 tonnes. After the record year in 2013 when liquid bulk expanded by a spectacular 31.9%, Antwerp has further established its position with these overall growth figures. The Port of Antwerp is an important investment location for many companies in the oil and chemical cluster. Exxon Mobil recently announced an investment of more than $1 billion, thus joining the series of investments carried out in the Port of Antwerp over the past few years by world players such as among others Total, BASF, Gunvor, Evonik and Kuwait Petroleum International. And the speciality chemical group Lanxess took its new polyamide plastics plant in Lillo into operation at the beginning of July. The price ticket for this world- class facility is €75 million. The Antwerp plant will be the hub for worldwide distribution of polyamide. During the first six months of this year 6,991 ships called at Antwerp, 3.4% fewer than in the same period last year. On the other hand the gross tonnage rose by 1.0% to 165,121,359 GT, thus confirming the trend towards fewer but larger and more heavily laden ships being served in Antwerp. The crucial importance of Antwerp for the Flemish economy is demonstrated once more in the updated report by the National Bank of Belgium about the economic significance of the Belgian ports. In 2012 (the last year for which full figures are available) Antwerp generated added value of €9.97 billion, an increase of 3% on the previous year. The amount of direct employment also rose, with 60,873 direct employees compared with 59,965 the year before, an increase of 1.5%.